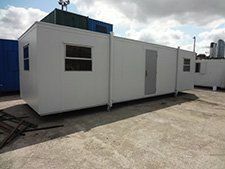 We offer high quality new and used portable cabins, portable offices, modular portable buildings, shipping containers, site offices and toilet blocks for sale and hire, available in a wide range of styles and sizes to meet your specific requirements. Our aim is to create high levels of customer satisfaction by providing our customers with the lowest cost mobile and on-site storage solutions available – both new and used portable offices and buildings. Used container cabins, portable cabins & offices. All of our used portable cabins, site offices portable offices are cleaned and tested by fully qualified personal. Used container cabins are often used as an excellent source of low-cost office and storage solutions. Our used portable buildings range includes refurbished, anti vandal, temporary portable buildings, container houses and cabins. All can be modified to your exact requirements. New portable buildings which are available in any size and finish are great for building contractors, home owners and virtually any business with an overcrowded facility. They offer the benefits of a dry, sea worthy shipping compartment with the added bonus of being easily transported for on-site storage. Choices of new portable buildings include traditional jackleg cabins, container houses, anti vandal and toilet blocks. Looking for something specific or made to measure? We will be happy to quote for any new build steel fabricated units any shape or size. Please feel free to submit your drawings or plans and we will give you a competitive quotation by return. Container Cabins are usually made of steel and can be 8ft wide, 8.5ft high and most come in 20ft and 40t sizes. Some container cabins are modified for use as modular homes. There are about 17 million shipping containers in the world. Container cabins provide the UK with a wide range of container cabins – both portable cabins and shipping containers. Have a look at our available containers and select your choice. however – if you want a bespoke container spec – just fill in the contact form with your container requirements and we will get back to you with a range of products as soon as possible.